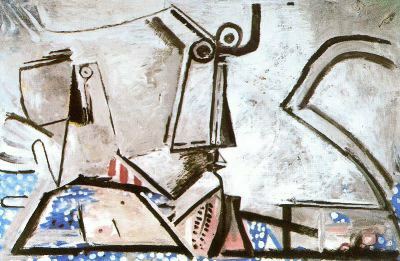 The mythologization of Picasso into a titanic Hero of Modern Art has tended to obscure his work. But it is a process with a lengthy tradition. From time immemorial, the extraordinary creative powers of artists have been assimilated into heroic ideas. Since the Renaissance, when artists were released from their deprecating definition as mere craftsmen, imagination and obsessive inventiveness have been considered their characteristic traits. In this view, the creative artist is inspired, and produces his work in an uncontrollable frenzy that verges on madness. The legend has it that the artist comes into this world a prodigy. His genius can be seen in the fact that essentially he needs no teacher, and develops by virtue of innate powers. Tales relating to Raphael are matched by the claim, de ri-gueur in every Picasso biography, that his father gave the young Pablo his brush and paints, never to paint himself again. For this reason, his academic training was long ignored or dismissed as unimportant. This is complemented in the Picasso myth by an emphasis on the virtuosity of his craftsmanship, a technical command well above the norm. An artist of genius, after all, can establish the most astounding shapes and likenesses in seconds. Through this ability, he also has absolute mastery of every conceivable means of expression, style, and creative insight. Being a genius, the artist is daemonically close to insanity, his creative power thus deriving from a spirit either divine or deranged. In physical terms that power is seen in sexual prowess at once fearsome and magnificent. The artist possesses unusual energy, best seen in his attitude to his work. Obsessed by his ideas, he enters into the world of his work entirely, labours for hours and days without pause, no longer registers the petty concerns of the real world. Much of this is quite plainly a description of the real Picasso. Because this is so, it is difficult to distinguish fiction from reality, role-playing from authentic personality. 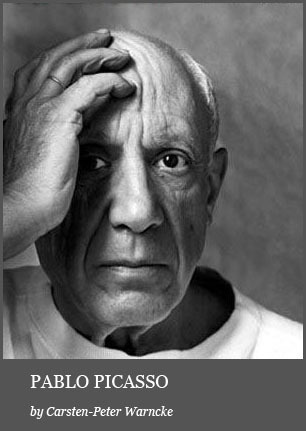 Time after time, in consequence, the old heroic image of Picasso continues to be perpetuated. Modernist innovation is attributed to him far beyond what is historically verifiable. He is stylized into the major figure in a cult of genius that remains with us to this day. It is of course true that in his long life Picasso produced a formidable quantity of work, more than perhaps any other artist, and that his creative curiosity was boundless. He was active in painting, sculpture, graphic art and craft, in fact in every branch of the visual arts bar architecture. And he remained tirelessly active till the very end of his life. So it was that his work came to be seen as infinite in extent. 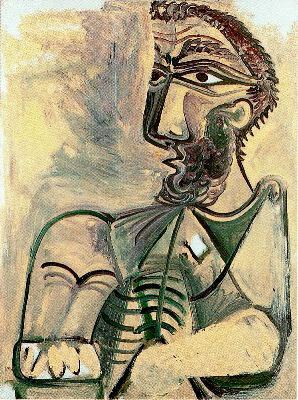 Astoundingly, Picasso's thematic range was slight. Again and again we encounter the artist and his model, bullfights, bathers, figures from classical mythology, or portraits. In the course of his career he established a repertoire which he deployed and redeployed constantly. His amazing ability to ring the changes obscured perception for many years of his true creative character. But there was a limit to variation in his work. What invariably prevailed was form: his work always evolved from the line, from the principles of the draughtsman. 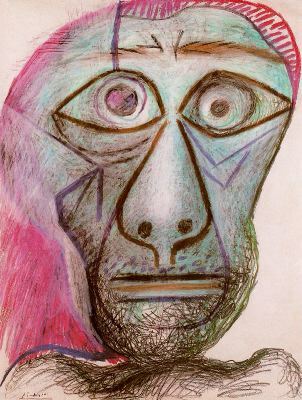 For Picasso, sculpture, painting and graphics were not primary categories in their own right. His versatility resided primarily in the range of means he brought to bear on what he wanted to express. At heart, his interests were single-minded in the extreme: he was out to test the representational values of form. 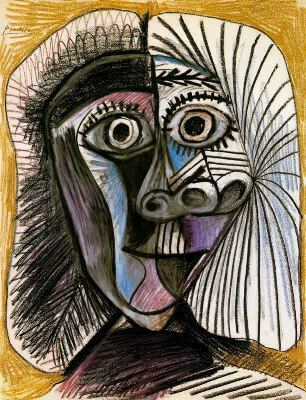 There is no autonomy of colour in Picasso; nor do spatial values have any real independence in his work. He always considered colour a means of reinforcing the expressive power of form, either by emphasizing or by diluting the impact. In his extensive sculptural output there are practically no works of a conventional kind, apart from stray figures carved in wood in 1907. His sculptural work developed from drawings, establishing spatial presence through illusionist effects. Pure abstraction never meant anything to him, even though some of his pictures - such as the 125 lithographic illustrations to Pierre Reverdy's book "Le chant des morts" (1946-48) - show that he was well aware of the possibilities open to abstract art. 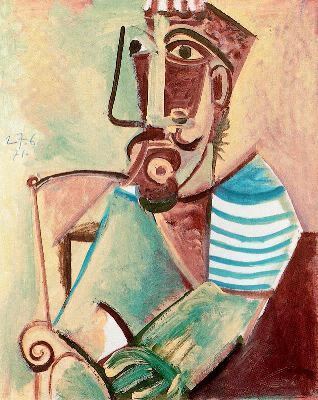 Picasso's works were links in a chain of experiments. Hence the artist's many statements denying the finished character of individual works, seeing them rather as parts of an evolutionary process. Every picture, artefact and sketch he did records a visual experience, and thus possesses a value of its own, as a fragment of the whole. 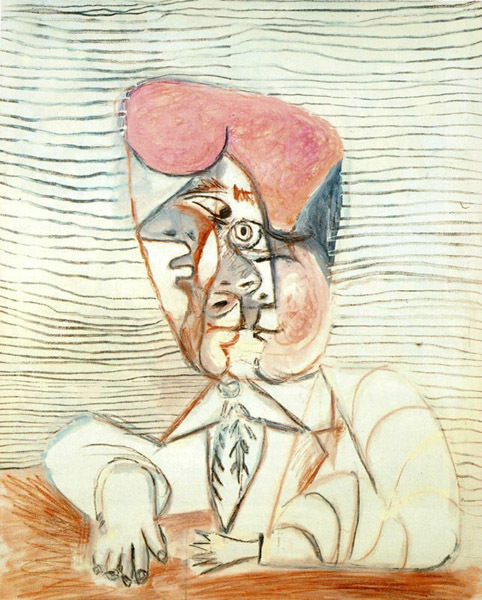 Views of Picasso depend largely on the criteria involved in the viewing. If we were to judge him by conventional standards, the vastly ambitious scale of his productivity and versatility would be cut down by the fact that the many thousands of studies led to relatively few final works of any substantial complexity. The concept of what constitutes a work of art has itself undergone change. We no longer check to see whether prior intentions have been enacted according to plan. Anything can be a work of art. 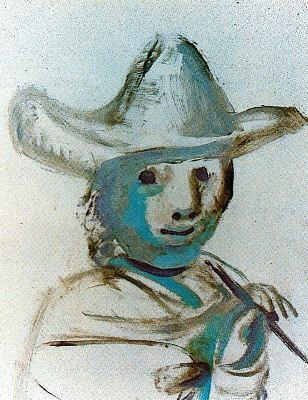 Yet even by these new criteria, Picasso's unusual ceuvre is unique in extent, if not in diversity. His rivals include Edgar Degas, who produced not only paintings and drawings but also graphics and sculptures of genuine innovative importance, and Max Ernst, the Surrealist whose work included drawings, paintings, sculptures and montages that introduced new departures into modern art. The view of Picasso as the pre-eminent genius of the century is due not least to his willingness to fulfil public expectations of artists. In Henri Georges Clouzot's revealingly titled film "The Mystery of Picasso" (1956), for instance, the artist demonstrates his working methods to the camera, and thus to millions: it is an eloquent proof of his approach to the myth. He is not only constantly at work on the canvas, in order to convey his conviction that a work is continually involved in a process of creation and destruction, but he also shows the artist's caprice at work, making changes as he chooses, and in this respect conforms to the legend. It seems there is neither rhyme nor reason in his choice of a particular point to begin painting; but then, with astounding speed, he has painted an entire composition. The rapidity of the act of creation, and the emergence of a rational result from a seemingly irrational process, are both essential factors in the myth of the virtuoso genius. 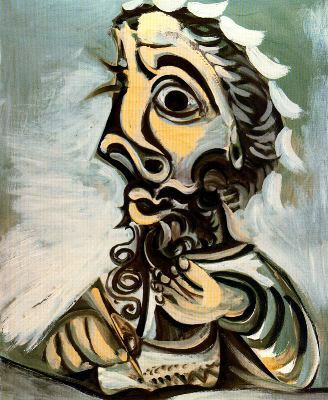 The artist as magus was a role Picasso quite deliberately played. He was not the only artist to do this. Rubens, for example, liked to play the part of lord and master in the realm of art when visitors were present. A Danish doctor named Sperling, who sought him out in his Antwerp studio, reported that while they talked Rubens continued painting, dictated a letter, and listened to readings of classical literature. Much the same was reported of Julius Caesar and later of Napoleon. 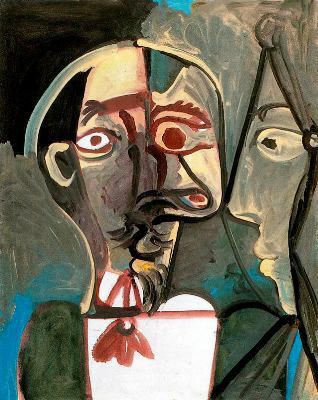 For Picasso, this role-playing afforded a way of concealing creative conflict behind a multitude of masks, and of confirming his own preeminence. As early as the Thirties he was seeing himself as the new Rembrandt, and from the Fifties on the charades of historical role-playing became an important creative strategy for him, a process centred on the subject of the artist and his model, including the concept of the artwork as the artist's child, the idea that creativity is a kind of sexual act, and the banal notion that the model was the artist's lover. 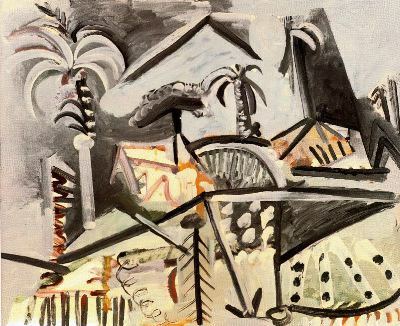 Picasso's own life seemed to afford the public concept of the artist as social outsider ideal proof. The artist is permitted to live out liberties denied to others trammelled by societal constraints. 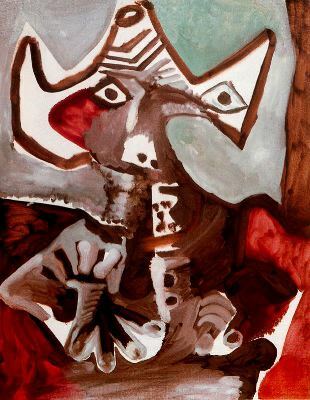 In the work of his old age in particular, Picasso presented himself to a shamelessly voyeuristic public as a man of unfailing potency: a compulsively, feverishly productive artist wholly immersed in his work. This was both a mask and a vital means of self-preservation. His work, forever expanding into new genres, substantiated his image as a universal genius. Like a new Michelangelo, Picasso appeared before the public as painter, sculptor, writer. His work inevitably varied in quality - but then, Michelangelo's sonnets were by no means comparable, in literary value, with his majestic accomplishments in sculpture, painting and architecture. 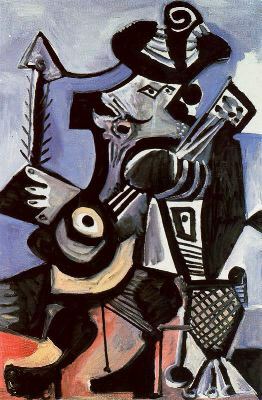 Of greater interest in relation to Picasso's status in art history is the clearly apparent factor of conscious strategy. This is at odds with prevalent notions of the artist working barely consciously on the products of his own imagination. But in Picasso's ceuvre we plainly see a rational, logical, consistent method. At core he was an intellectual artist. For a long time, his ways of articulating his ideas obscured this crucial fact. In a real sense, Picasso transferred ideas into art, and created unified harmonies of idea and artwork, form and content, which are fundamentally traditional in nature and highlight his classical character. In this respect he was essentially different from modern concept art and the father of the movement, Marcel Duchamp. In concept art, the concept precedes and accompanies the work, which in turn refers to the concept. A verbal key or explanation is required if the whole is to be grasped. 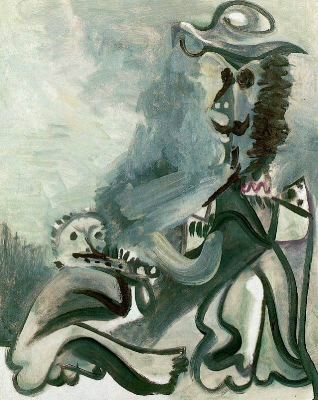 Picasso's work, by contrast, shows. The statement is made visible. His work is inherently comprehensible. There is no gap between abstract content and concrete form. Uniquely in the 20th century he was capable of radical innovation on the one hand but on the other of continuing traditional lines. Thus in "Les Demoiselles d'Avignon" he vanquished the representational picture, while in "Guernica" he revived the genre of historical painting in a new form. Picasso's true greatness and significance lie in his dual role as revolutionary and traditionalist at once. He gave a new vitality to art even as he preserved the creative presence (outside the museums) of its history. For this reason he became the pre-eminent figure in 20th-century art.